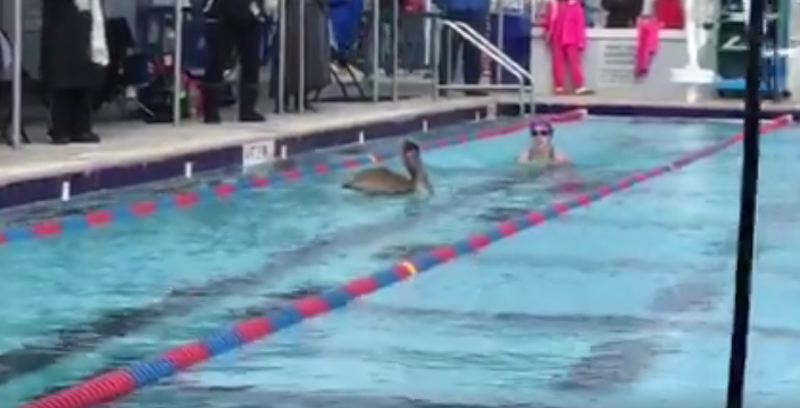 A swim meet in St. Petersburg, Fla., was briefly interrupted by a pelican that understandably thought a big pool of water was a good place for it to hang out. The pelican eventually left the pool without incident, but the swimmers should be feeling lucky to still be alive. As you are surely aware, pelicans are hypercarnivores that crave nothing more than the sweet taste of flesh. Count your blessings, little swimmers. The bird must have been full.